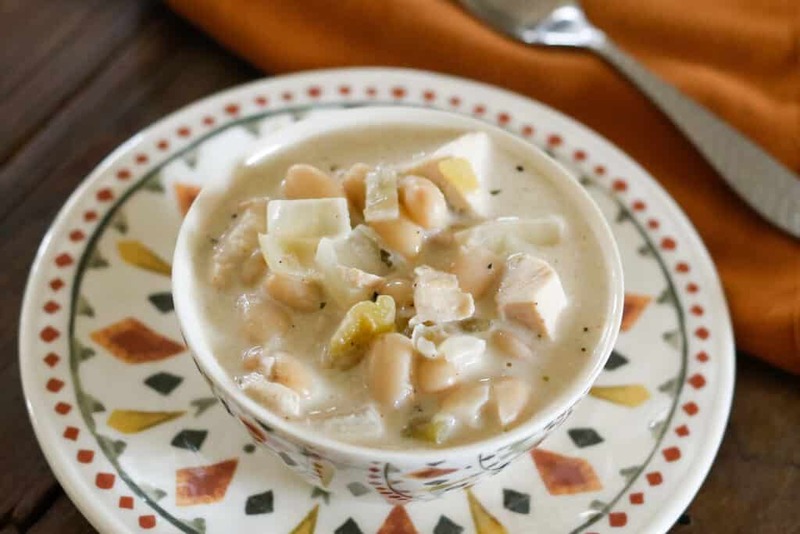 White Chicken Chili is a creamy soup filled with tender chunks of chicken, soft white beans, green chile and plenty of spices. Truly more soup than chili, this has been one of our favorite rainy day meals for several years now. I first saw this Creamy White Chili over at Mel’s Kitchen Cafe and I think I tried it within a day or two. My family loved it at first bite and over the years we’ve tried almost every possible variation on the recipe. I’ve made it in the crock-pot and on the stove top, eaten it right away or stashed it in the freezer for later. It’s simple to make for a weeknight meal but is also a welcoming dish that begs to be lingered over on cold winter nights. For chili lovers getting a little sick of tomato based chilis, White Chicken Chili is a welcome change. This chili gets its creaminess from a combination of sour cream and heavy cream. The tang in the sour cream is balanced by the rich flavor of the heavy cream and the savory chicken broth. I’ve used both homemade chicken broth and canned broth in this recipe. Either way, it comes out tasting delicious. 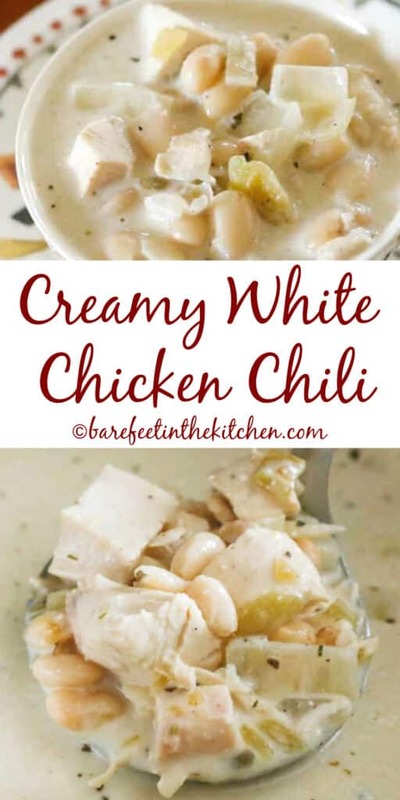 White Chicken Chili has become a well-established favorite in my house and I double the recipe almost every time I make it. This way, we can enjoy it right away for lunch or dinner and have plenty to save for later. This soup freezes well and it’s the most popular soup in our freezer anytime the kids spy it there. There are a few different ways to freeze it and all work just fine. You can let the cooked soup cool completely, then transfer it to freezer safe containers for storage. You can freeze it all in one large container or portion the chili into several smaller containers to have single-serve portions ready to go whenever hunger strikes. Reheat this chili in the microwave or allow it to thaw at room temperature before warming it on the stove. If I’m making this recipe way ahead of time, I will often combine all the ingredients together in a freezer-safe zip-close bag (except the sour cream and heavy cream). I freeze the soup uncooked, then thaw and proceed with cooking the soup as directed. There are times in all of our lives when, despite the best of intentions, we’re rushed to get a meal on the table. When you’re facing both a tight schedule and a house full of hungry kids, you start to come up with ways to make your favorite recipes ready in even less time. That was the case when I discovered how to make this White Chicken Chili in just 15 minutes. I simply substituted the chicken breast in the regular recipe with 3 cups of cooked chicken. Anytime I make chicken, I try to make a little extra so I always have leftovers on hand for soup, salad, enchiladas or other easy meals. I’ve lost track of how many times I’ve made this recipe, in all of its variations, over the past few years. Served on its own for a simple meal, with a side of bread or a salad, as an afternoon snack; there isn’t a wrong way to make and serve this soup. 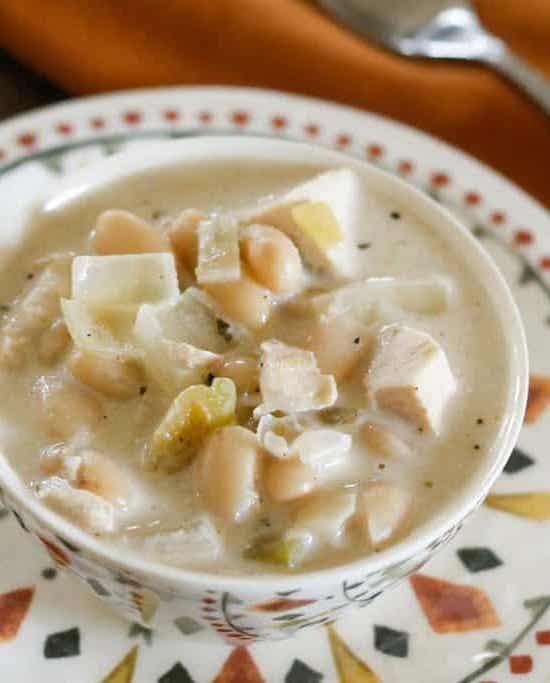 For more great soup recipes that freeze wonderfully, you’ll want to check out our recipes for Hearty Italian Vegetable Beef Soup and White Bean, Cabbage, and Sausage Soup. This Skinny Chicken Fajita Soup is on my radar to try soon too. I love having a tasty selection of soups in the freezer all the time. I don’t think it could ever be possible to have too many soup recipes. If it’s chilis you’re after, I’ve got you covered there, too. Hearty Pepper Chili has never served me wrong, packed with beans and lots of spicy Mexican flavors. For an easy recipe that uses up lots of canned goods in your pantry, give The Easiest Chili Recipe Ever a try. Vegetarian Four Bean and Chipotle Chili will satisfy even the most ardent meat lover’s chili cravings (and, of course, vegetarians love it too!). And Green Chili Stew with Sausage and Tomatoes is as hearty and flavorful as they come. In a large saucepan, over medium heat, heat the oil. Add the onion, fresh garlic and saute 2 minutes, until fragrant. Add the broth, beans, chile and the spices. Bring to a boil. Add 3 cups COOKED chopped chicken. Reduce the heat and simmer uncovered for 5 minutes. Remove from the heat. Whisk together the sour cream and heavy cream, pour into the hot soup and stir to combine. Serve immediately. Combine all ingredients (except the sour cream and heavy cream) in a crock-pot set to LOW heat. Once the chicken is cooked and tender, shred lightly with two forks or tongs. Toss the chicken pieces in the juices as you shred gently. Whisk together the sour cream and heavy cream until smooth and then pour over the mixture in the crock-pot. Stir to combine and cook on low for another half hour or so, until the soup is warm throughout. STOVE-TOP DIRECTIONS: In a large saucepan, over medium heat, heat the oil. Add the chicken, onion, fresh garlic and saute until the chicken is no longer pink. Add the broth, beans, chile and the spices. Bring to a boil. Reduce the heat and simmer uncovered for about half an hour. Remove from the heat. Whisk together the sour cream and heavy cream, pour into the hot soup and stir to combine. Serve immediately. Enjoy! 15 MINUTE DIRECTIONS: In a large saucepan, over medium heat, heat the oil. Add the onion, fresh garlic and saute 2 minutes, until fragrant. Add the broth, beans, chile and the spices. Bring to a boil. Add 3 cups COOKED chopped chicken. Reduce the heat and simmer uncovered for 5 minutes. Remove from the heat. Whisk together the sour cream and heavy cream, pour into the hot soup and stir to combine. Serve immediately. Enjoy! Once the chicken is cooked and tender, shred lightly with two forks or tongs. Toss it in the juices as you shred gently. Whisk together the sour cream and heavy cream until smooth and then pour over the mixture in the crock-pot. Stir to combine and cook on low for another half hour or so, until the soup is warm throughout. Enjoy! first and then reheated on the stove-top. I've also prepped all ingredients except the cream and sour cream and frozen the uncooked mixture in a large Ziploc freezer bag. When ready to cook, thaw completely and then cook as outlined above. I've included directions below for making this soup on the stove, in the crock-pot, and even as a lightning fast 15 minute meal made with pre-cooked chicken. 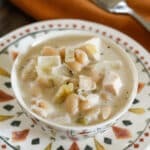 I had never eaten WHITE chili before, but I made this recipe for supper tonight and it was AMAZING! This will definitely be making repeat appearances on our dinner table. I served Pecan Pie Muffins with it---a perfect match of spicy soup and sweet muffins. Tonight for dinner I made the white chicken chili when I saw it posted on your Fb page....marvelous!! I have your Cranberry Christmas cake in the oven, for the first time, and this beautiful white chili is on my stove, for the second time. You are the gift that keeps on giving! I found your recipe after receiving a gift of white chili after a recent surgery. It was so good that I knew I had to find out how to make it. After a lot of online searching, I came across your recipe and I am so happy I did. It is the BEST white chicken chili, and have made it several times. Thank you for sharing! My niece got me started on White Chicken Chili and I think it is so good. The ingredients in this one sounds so good. Pinned it! I just made this chili-it is SOOOO good! I also added lime juice, chili powder, and cilantro and used greek yogurt instead of the sour cream. Recipe is definitely a keeper! Looks great, love the green chiles! Make this if you haven't, it's sooo good! I love white chicken chili. It's been a couple years since I've had it, but I've never made it. I have this recipe in my slowcooker right now. Only thing is I add tortilla strips and cheese on when it's done. Was not a huge fan but I am allergic to garlic so couldn't use that and we hate green chilis. We added creamed corn and more chicken than was called for to help avoid it not being too thin. We must have lacked the flavor from the chilis. 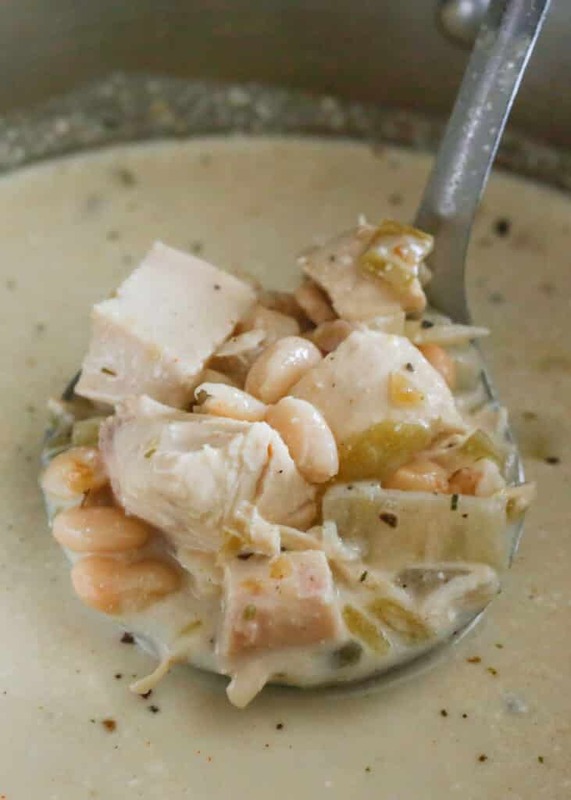 I do a great version of white chicken chili that's kind of mixed with red aspects (petite diced tomatoes) as well as a Soup Starter, corn, really any veggie I have, and pinto beans on top of any white bean I have and shredded chicken that is excellent. I think I must be attached to my crock pot way of doing things. I'm sure those who stick to the recipe would be pleased. I'm making this recipe for the fourth time. My family loves it! I use fresh chicken breasts, canned white northern beans, and usually a little less diced chiles if I'm making it for kids, but otherwise all the same. Mine's on the crockpot right now and can't wait to have it later with some corn bread muffins and a fresh salad :). I have never gone wrong with one of Mary's recipes!